Regardless of protocol (RNDIS or CDC-ECM) you will need to have an INF file somewhere on your Windows system. This INF file can be installed seamlessly from Windows Update (the driver repository part of Windows Update), or it can be copied onto the system by the end user as part of a driver install package. The process is actually identical in both cases. In one case Windows Plug-n-Play support is looking for and downloading the driver installation kit and using it directly while in the other the user downloads the driver installation kit and tells Windows Plug-n-Play where the kit is unpacked. These are normal situations with installation of any device driver in Windows. 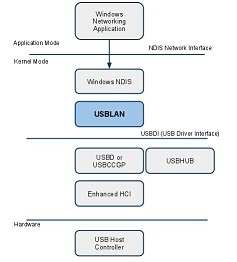 Belcarra Technologies’ USBLAN for Windows solution has been available from Windows Update since 2009. Device drivers cannot be published in Windows Update unless they have met the Windows Logo Program requirements, submitted to and signed by Microsoft. The phrase "silent install" refers to avoiding the "nag" screen Windows dialogue box scenario that will pop up if you attempt to install un-signed drivers or drivers not signed by Microsoft.